Gulf coasts of the United States and in the Caribbean. Fort Schuyler, a state-of-the-art facility which opened in October 2014 and serves as a state-of-the-art train- ing platform for both students and professional mari- ners alike. Barge Simulator Center helped to ? ll an enormous training hole in the New York area, as the only other available simulator in the area had long since been moved to the Houston. 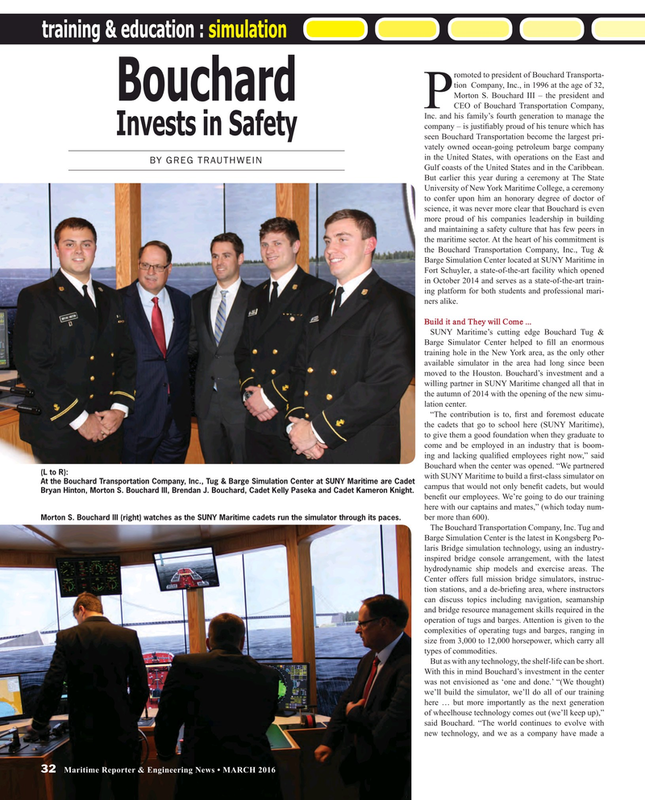 Bouchard’s investment and a willing partner in SUNY Maritime changed all that in the autumn of 2014 with the opening of the new simu- lation center. Bryan Hinton, Morton S. Bouchard III, Brendan J. Bouchard, Cadet Kelly Paseka and Cadet Kameron Knight. bene? t our employees. We’re going to do our training here with our captains and mates,” (which today num- ber more than 600). Morton S. Bouchard III (right) watches as the SUNY Maritime cadets run the simulator through its paces. Center offers full mission bridge simulators, instruc- tion stations, and a de-brie? ng area, where instructors can discuss topics including navigation, seamanship and bridge resource management skills required in the operation of tugs and barges. Attention is given to the complexities of operating tugs and barges, ranging in size from 3,000 to 12,000 horsepower, which carry all types of commodities. But as with any technology, the shelf-life can be short.